Ok folks, I trust we all had a great New Year's weekend.... Now let's get building! Can I join this with a AAVP-7A1? I'm onboard for this campaign. Not sure what I will build but with a Company (Rein) of LVTs and AAVs in the stash I have plenty to choose from. Can I come in with this? This will be the first time I've used more PE than a simple aircraft seatbelt, so I'll be needing lots of help and advice. I've made a start - filled the drainage holes in the sides, and prepped the main hull parts for assembly. 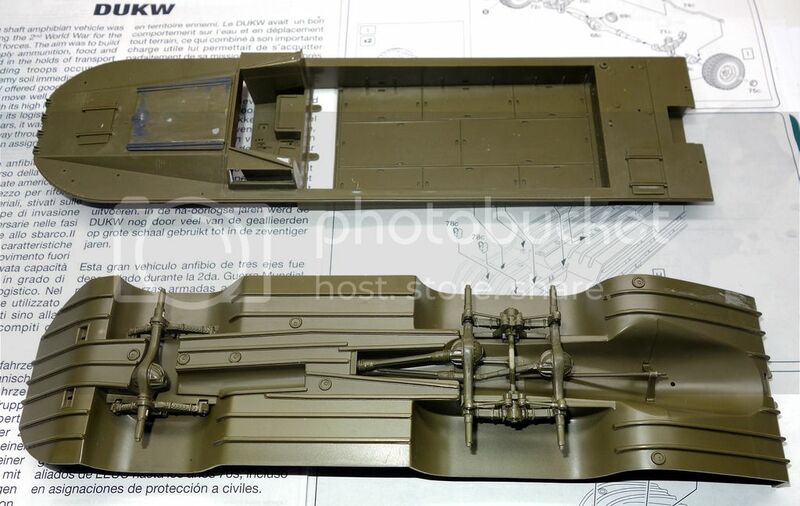 Can anyone who has previously built this kit tell me if I'm safe in the assumption that I can pretty much assemble the hull and transmission before I start with the fiddly and (for me anyway!) easily damaged PE parts on the upper surfaces? With regard to the cab, what's the best way to go about this regarding painting - do all the PE bits that will be in the base colour, and add the other parts - wheel, dash etc afterwards if possible? I think I'll go for the Iwo Jima scheme - inspired by the wonderful diorama created by Joaquin Gª Gazquez. Having some trouble deciding what the modelmaster colour references relate to in my stash of Humbrol & Vallejo. Have seen Humbrol green 30 mentioned as a possible USMC match? I may just end up eyeballing it and selecting whatever seems pleasing to me! All pointers gratefully received, thanks in advance! had a wee accident with a bottle of Tamiya cement on the stern, port side. Luckily it hasn't done too much damage and should be easily rectified. Also had a couple of drops of solvent on the engine hatch - one xylene, the other acetone - was experimenting with thinning Mr Surfacer which I have just acquired for the first time. You would have thought after the first accident I would have learned to get the the good parts out of the way first! Very nice clean build. Keep it up! Couple of months ago an IDF amphibious unit was declassified. The unit was comprised of pt76 and btr50, and was supposed to be an amphibious bridge head in any collision with Egyptian forces that required the crossing of the suez channel. The existence of such unit was probably known already (as the vehicles are on display at Latron), but the name was revealed - Dov Lavan, or "white bear". 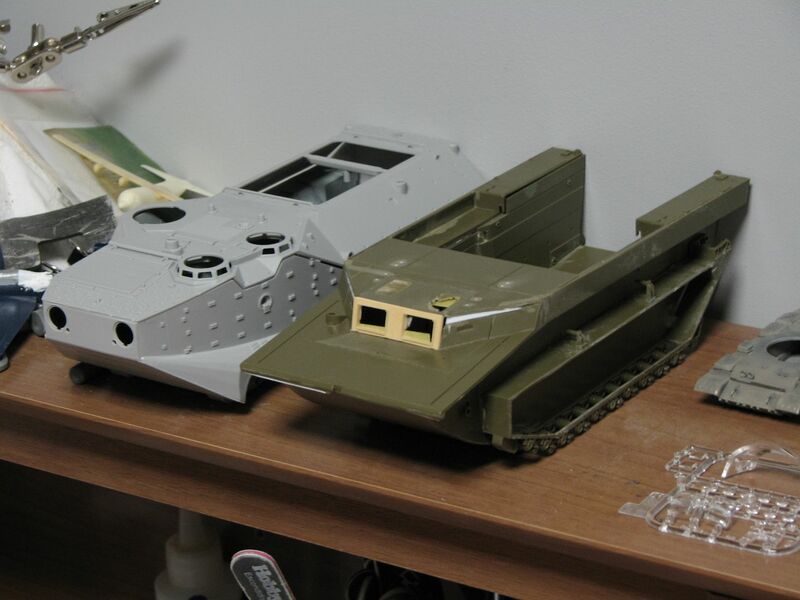 So as an homage to the official declassification, I'm going to build 2 models, a PT76 and BTR50, and hopefully put them in a small diorama. Hull assembled, top just sitting there for the meantime. Eduard didn't call out for the kit side meshes to be removed, but I did it anyway, and installed tiny lugs to support the PE mesh. Don't worry, this isn't some kinda freaky camo scheme- just shot some primer onto the filled drainage holes to see where I needed to sand! Also made the steering posed as if turning, and added a ring of copper wire to the transmission boot as there was a bit of a gap there. Getting ready for the real fiddly bits now! This is what I will be building. Happy modelling and here's to a good campaign. That looks really nice. I finally got a new camera, so will post some progress a bit later. Both models arrived well and sound, and because I got a nice deal on them, I'll be able to splash in the AM pool though the selection for these two models is poor. 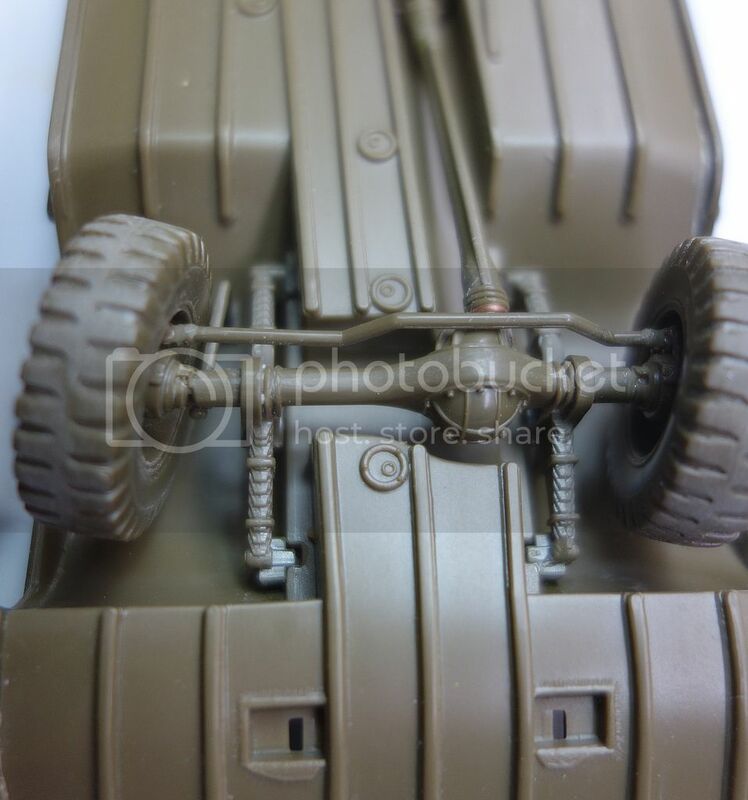 There's a track set I will get from masterclub and try looking for a place that has th pt76 PE in stock. its the same in the other kit, there are like 2 sprues! My Trakz LVT2 resin conversion arrived this week so I pulled the Italeri LVT4 from the stash to begin the back dating. 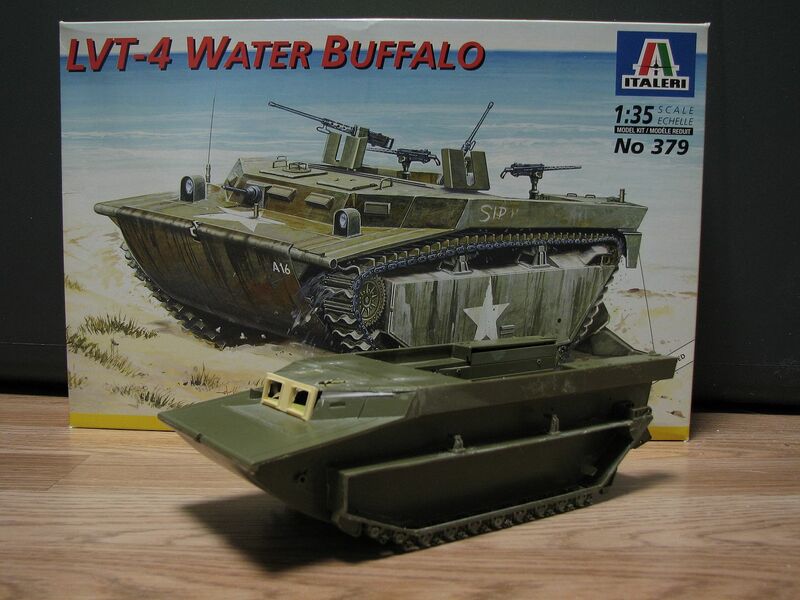 This will be an early unarmored cab version of the LVT4. The specific vehicle I am modeling is a vehicle from 3D Landing Vehicle Tractor Battalion that landed on Iwo Jima in Feb ’45. 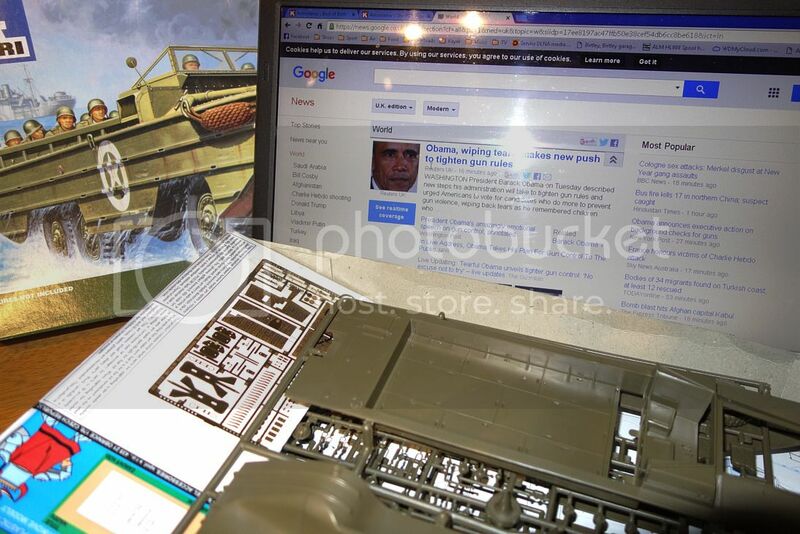 To show off the work on the cab and the interior I will not be adding the cab’s add-on armor plating. I am also including a Verlinden resin interior. The basic OOB hull went together quickly; this hull was warped less than the previous kits I assembled. I am still finagling proper fit of the forward glacis, causing more headache than I anticipated. I also sawed away the armor plates from the sponsons as they are too thick and the vehicle I am modeling does not appear to have them. The second picture is the LVT4 positioned along my P7 hybrid build, the 1940s LVT looks like a monster alongside the 1970s LVT. Finally getting a chance to start the campaign. Here's the moldy oldie I'll be doing. The Monogram M29c Weasel. This is the 1972 boxing with the Shep Payne Diorama Hints included. The decals are sealed in the bag with the parts so maybe they will be useable. I'm mainly an OOB builder but maybe this will bring back a few memories. 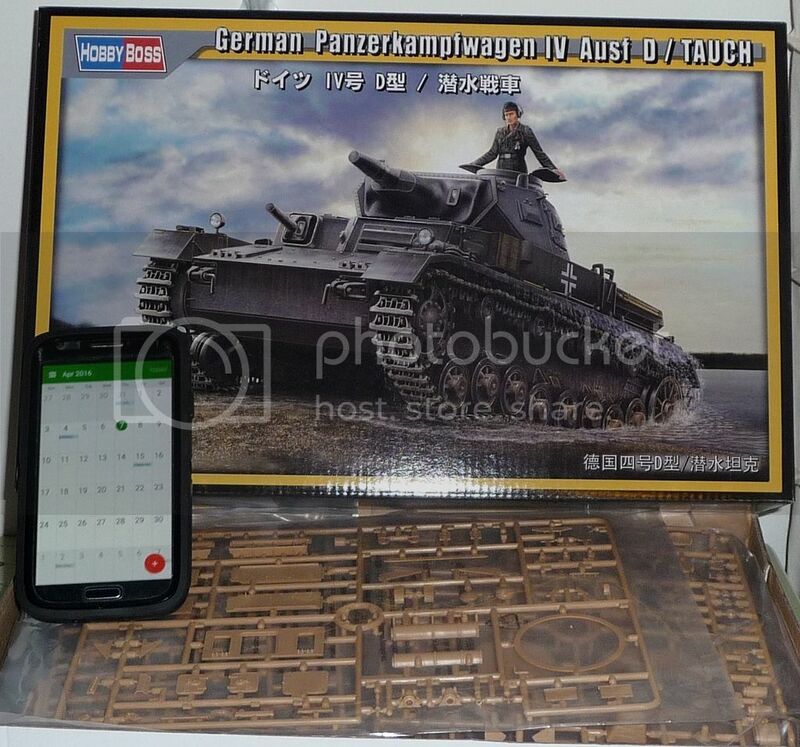 Never did think that Monogram did 1/35 kits. Keen to see how this oldie builds. Hey Doc, check out the Archer decal set for the DUKW. There is some great stuff there in the way of warning lettering to place on various parts of the vehicle and operational plaques for the cockpit!